Transitional Justice in Egypt: Scopes of Application - Egyptian Institute for Studies. To understand the negative impact of violent conflicts on societies, it has been essential to look into the effect of post July 3rd-2013 conflict on the Egyptian society, and what are the possible ways to overcome its repercussion. With due focus on possible transitional justice as a manner of bridging back the society post re-conciliation; this paper used two surveys to study societal tendencies for conciliation and to understand a focused group’s intentions and qualifications. The survey, done initially in May 2015 and prospected to be redone during the coming months of 2019, collected 1181 response to show social tendencies towards transitional justice, violence range, and credibility of different actors, while the focused survey on media and human rights professionals has provided an assessment of their security, mobility and possible manners of contribution. In summary, this paper is running a diagnosis on the society’s stands from transitional justice and the possible actors, and actions to pave the path for transitional justice even before the conflict is de-escalated. Going through this paper, you will examine preexisting societal tendencies in 2015 while a discussion of results provides a scope of understanding for policy makers. The consecutive part of this paper shall provide a comparison between 2015 and 2019 results and provide us with patterns of change and possible scopes of action. For the past years, a civil-militant conflict has been going on in Egypt. It started with the army ousting the civilian elected president Dr. Mohamed Morsi. The conflict resulted in a death toll over 3500 persons, and around 41K political prisoner in 2015 (is or prospected to be detained (wiki thawra, 2014). Despite the fact that many would prioritize working on the de-escalation of the conflict, in this paper I over looked de-escalation to work on transitional justice in any possible process of reconciliation. The ongoing political discourse of the conflict in Egypt pictures the conflict as a zero-sum conflict that can’t end without one party losing. Despite the discourse, there are manners to deescalate the conflict if there was any political will that would get us to a win-win situation; but the discourse keeps proving that it’s not a prospected option. For this reason, I decided to work on a more fundamental area that would not be affected much with the current political arena and shall have more relative benefit, which is “Transitional Justice”. More on discourses, despite the fact that the political arena discourse has no prospection of de-escalation; “Reconciliation” as a concept appears frequently in the discourse mostly negatively. The social response (responses to news online/ social media dialogues/ social media responses to official statements and personals) to this appearance however is always negative from both sides’ supports. The response is usually framed in a way “We can’t reconcile with them after what they did to us”. The term “What they did to us” varies depending on which side is talking. I took my decision based on the red flags the social responses raise. If the political will is present at any time the political section of the conflict shall be resolved, yet, the social gap could not easily be resolved. This paper is studying transitional justice as a manner of reconciliation to bridge back the society and sustain any resolution to the ongoing conflict. This is paper is aiming to answer the research question: How would Human Rights and Media actors affect a process of transitional justice post the currently ongoing conflict in Egypt since July 2013? (Representative of Freedom and Justice party, know to be political wing of Muslim Brotherhood in Egypt post Jan 25th2011 revolution.). This conflict was different in terms of the size of atrocities civilians were subjected to in terms of mass human rights violations. With over 3500 civilian people on the death toll, the state security and military death toll over 300 this conflict could rise to or be considered as a “Civil War” according to (Coiler, 2007). Not only that, the detainees from the other side is over 30K people with approximately a thousand on death row. The gap the society is facing is extremely large especially with the July 24th, 2013 speech where general AbdulFattah Al-Sisi has asked the public for an mandate to face “possible terrorism”. This mandate, which took place on Friday July 26th 2013, was considered Al-Sisi’s supporters agreement to the mass killing that followed on the following day, and on August 14th 2013 know for “Rabaa Massacre”. The above resulted in a polarization movement that has not been experienced before in Egypt. The polarization is being maintained that it’s turning into a long-term divisiveness of society that’s not being dealt with. Thus; a need for measures to overcome such divisiveness in any case of conflict de-escalation has drove me to get started on working on transitional justice. Reconcilers, policy makers, media and human rights activists are the main actors that should be concerned with this paper as it focuses on their areas of action. Also all actors within the conflict are to be concerned as this paper presents a sense of the public opinions in the actors, processes and the future of the conflict. To start with, I shall present a quick review on the topic what is it and how is it defined. Reconciliation is the umbrella for my topic, many have defined reconciliation however the definition I am going by is the one presented by (Ramsbotham and others, 2005) that states that reconciliation of a conflict is a long term process that passes by different stages and go in different paths. The main goal of reconciliation as such would be to go from “negative peace” to “positive peace” through “justice”. By negative peace we mean the end of the violent stage of the conflict. The inner stage of the process “justice” also known by “Transitional Justice”, could take different paths to acknowledge the past, the truth and the criminal; either put them to trial or overcome the violence by forgetting the violence by “official amnesia”, to reach at the end of positive peace. “Positive peace” is simply defined by the long-term reconciliation, which sustains an absence of violence and maintains peace within the society. Further more on transitional justice, the International Center of Transitional Justice (ICTJ, 2001) defines it as “the set of judicial and non judicial measures that have been implemented by different countries in order to redress the legacies of massive human rights abuses. These measures include criminal prosecutions, truth commissions, reparation programs, and various kinds of institutional reforms”. The (ICTJ) highlights the importance of transitional justice in providing victims with right to see their perpetrators punished, to know the truth and to receive reparations. It suggests that if the massive human right abuses remain un-dealt with, it’s highly likely to divide the society. This divisiveness may result in the re-eruption of the conflict. This suggestion is where the (ICTJ) definition differs with (Ramsbotham and others)’s; as it doesn’t mention “Official Amnesia” supposedly because dealing with the atrocities is a main goal/ value of the center. However, is the conflict as severe to consider all these measures? Following a quantitative approach provided by (Coiler, 2007) a conflict could be defined as a civil war if it involves at least 1000 combat-related deaths while each side incurring at least 5% of these deaths”. And with referral to documentation following international standards by several organizations, in addition to the official announcements of the state; Egypt does fall into the category of civil war according to coiler. Yet to avoid technical mis-definition of the case, it could be said that although the conflict ongoing in Egypt is a post-coup conflict; it’s safe to say that it’s as divisive as a civil war, which threatens Egypt to be blocked in a conflict trap. At this point, the essential broad lines of the topic would have been reviewed. It’s advised that in case of resolving contemporary issues to compare it to past events in different geographical locations. However, despite the sincerity of the advice; it may not be the best when working on conflicts. Terry Waite, a humanitarian English author and an activist involved in several conflicts, has advised once in one of his academic interviews on conflict resolution that the reconciler should focus on the uniqueness of the conflict and be careful before drawing similarities and comparisons; as despite their appearances they shouldn’t drive the way through. That being said, I shall continue to discuss more on the operationalization of the research. This paper believes that media and human rights actors are expected to positively affect any possible post conflict process of transitional justice in Egypt. The independent variable is “Media” and “Human Rights” actors. These actors are all who work in any of the fields professionally or voluntarily. Media actors included editors, broadcasters, journalists, etc. at any news foundation or freelancers. While Human Rights actor include field researchers and analysts who work for specific organizations or as freelancers. Both of them include activists and citizen journalists who act freely within the community and can easily interact with people, understand them and reflect their views or deliver ideas to them. While the dependent variable is the possible process of transitional justice, starting from its incentives until it’s prospected results. The belief that these independent variables can affect the dependent variables is due to their common targets within the society. The actors of media and human rights widely interact with people within the society. Media actors are able to reflect the society’s views. They are able to raise awareness and introduce different ideas and opinions through their outlets. On the other hand, Human Rights actors are able to document, interact and take actions toward what people within the society are suffering / have suffered from. This manner of interaction of both actors within the society could be invested in providing incentives to start a transitional started and go through it in an effective way. The discussion section of the paper shall co-relate the theoretical approach with the results of the surveys conducted to elaborate more on the positive relationship between the variables. The research approach adopted for this research is both quantitative and qualitative approach. The main discussion of this research is based on 2 surveys in addition to a theoretical framework for analysis. The choice of surveys as a tool of data gathering was to explore the general trends and tendencies of the public opinion. 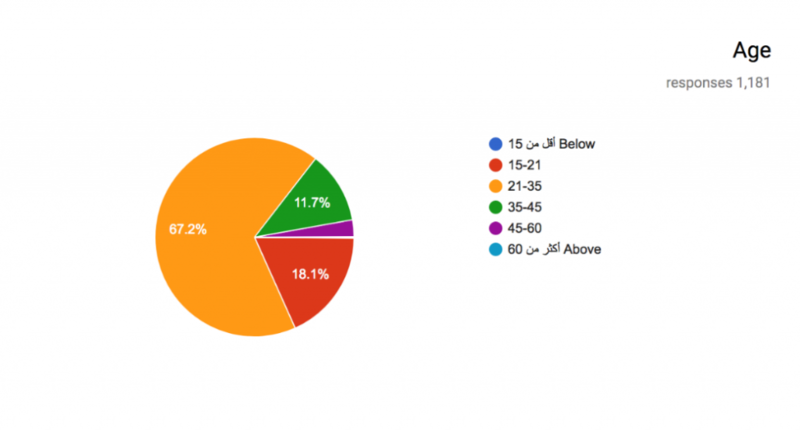 The first survey targeted the society in Egypt. The target sample was 1000 personal, the results received were 1181; 118% of the target. This survey was published online, conducted via Google forms and posted as embed on a “word press” blog to be able to monitor the traffic and the geographic exposure. 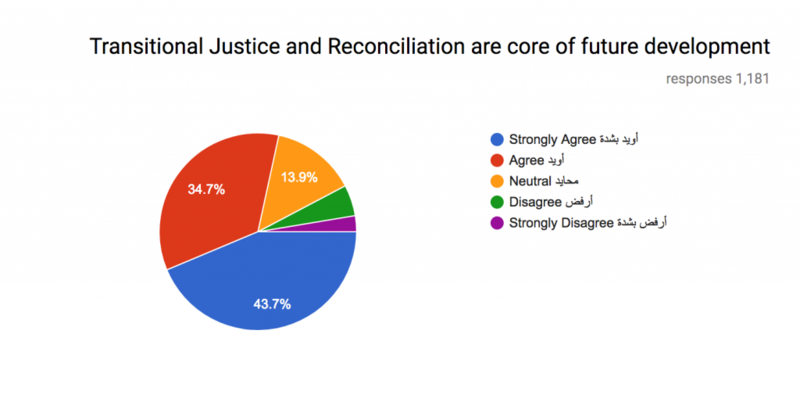 The introduction to the survey included a brief definition of both reconciliation and transitional justice. It provided the relevance and importance of the research as a whole, and the targeted sample for the survey. The survey consisted of 16 multiple-choice questions and a space for a free comment. As per the questions, the first set of questions measured the age, view of violations, transitional justice and conflict deescalating and resolving, in addition to the violence range the person is subjected to. Measuring the violence range had a shortcoming in one of the questions, as I have provided answers that included physical violence or detainment or both, but didn’t provide a space for other sorts of violence. However, people surveyed overcome that by using the free space at the end of the survey to mention that they have been subjected to other sorts of violence such as expelled from university or work, exiled from the country, oral violence or being haunted inside the country and psychological violence. The second set of questions was aimed at measuring the credibility of different actors in terms of application of transitional. I however have decided not to ask any questions regarding the credibility of the regime ruling the state, as it’s the one committing the violations; so the question regarding the view of the violations would provide an indicator some how if needed in analysis. Finally, the third set of questions was measuring the level of acceptance of post conflict-de-escalation process of reforms and memorandum as part of transitional justice, in addition to the role of transitional justice for development. This set of questions was only four questions. It could have been more, which might be counted as a short coming, however, a main factor for ensuring the public response to a survey is for it to be brief and short; so that’s my explanation as per the limitation of this set. To conclude the first survey, many shortcomings have been faced due to several factors, firstly, it was an online survey, which couldn’t possibly manage to get to all members of the society; only those with access to internet. Secondly, some of the supports of the current regime have shared the survey saying “It’s an intelligence report of the Muslim brotherhood, don’t do it”, which might indicate that the responses won’t be representative of both sides of the conflict. Thirdly, I avoided sending the survey to any officials of both sides of the conflict, the regime side would have gotten me in trouble; thus I eliminated both. 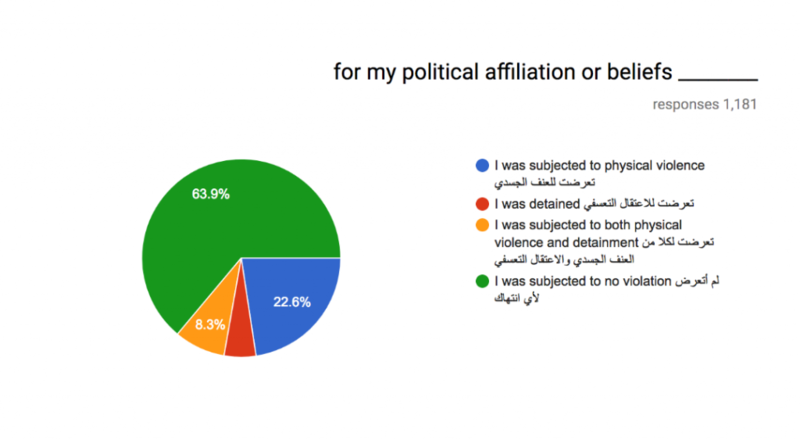 The survey was distributed via college students and professors in Egypt from both sides, in addition to many journalists from both sides as well and then it started circulating randomly. These are mostly everything regarding the shortcomings of this survey. The second survey was more focused, the sample size was 40, from human rights activists and lawyers and journalists. It was also conducted using Google forms, however, it wasn’t posted anywhere else and it was directly sent to the people surveyed. There was no target sample for this survey, however it was sent to over 20 journalists, only 13 managed to respond, it was sent to about 30 lawyers and human rights activists, 27 replied. An introduction was provided having the same information as the one before in addition to a description of the survey. The first survey was filled up anonymously. However, in this survey there were optional questions for providing name and contact info. The surveyed were asked to provide their age and specify whether they worked in the field of media or human rights. The last answer in the first section directed them to a specified survey for each. The first set of questions for each had to evaluate their access to information and their own feeling of safety and movement. It was provided as a scale from one to ten for each variable where zero showed the lack of the variable while ten showed it’s complete fulfillment. The next set of questions assessed the general feeling towards reconciliation from their interaction with the society. It has also measured the ability and willingness to contribute to the producers and reforms of transitional justice. The last set of questions were open questions, the first one is to comment with reasons to why is the credibility level of either media or human rights is low, and the second one is to provide possible ways of gaining back credibility for either. The survey ended with a final space for a free comment. This survey in terms of question structure is more mature than the other one. However, I still believe that the sample is not large enough, and there is no manner of measuring the relative representation of it as we don’t know the actual population of either field. Even more, I have chose to ignore the affiliation of the surveyed, yet however, from the names submitted, there is a better representation of different affiliations than the first survey. 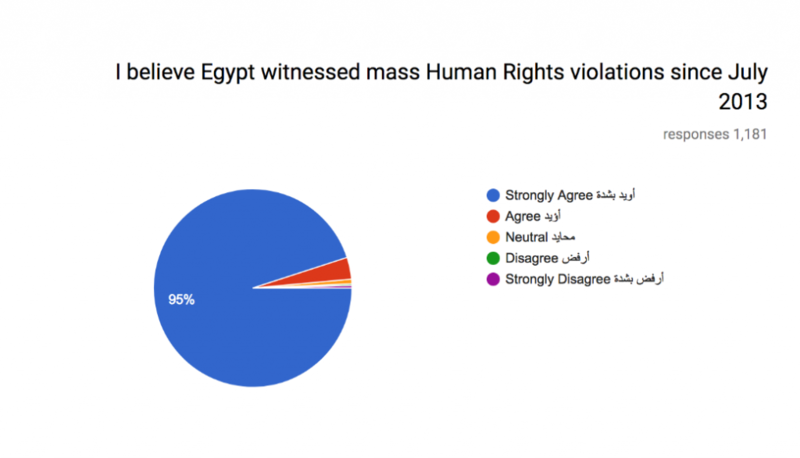 Looking at the surveys run, 95% of the surveyed strongly believe Egypt witnessed mass human rights violations, 3.6% present agrees, 1.5% is either neutral or disagrees. 67.2% of the surveyed were between 21 years old and 35. 18.1% were between 15 and 21, while 11.7% were between 35 and 45 years old. Only 2.7% of the surveyed were between 45 and 60, while 0.3% were either below 15 or above 60 years old. Before moving to the range of violence, I would quickly look into the results of the willingness of the society for reconciliation and conflict de-escalation in case transitional justice was agreed, and then their views of the time frame needed to deescalate the conflict. The agreement to deescalating the conflict is distributed upon the 5 levels of agreement presented. 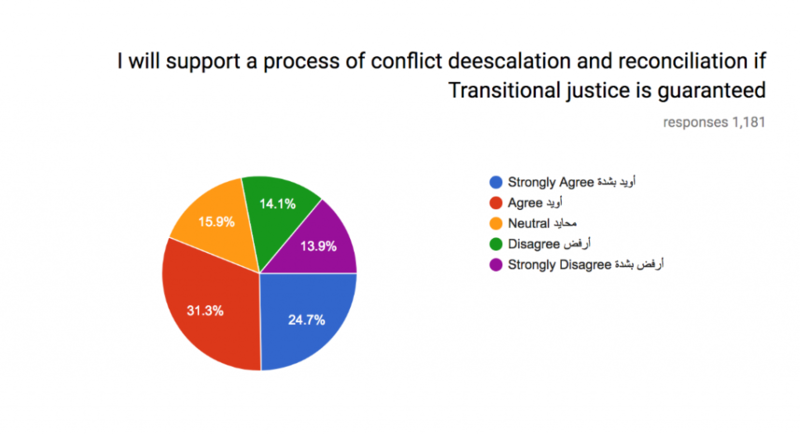 A total of 56% of the surveyed either strongly agree or agree to deescalating the conflict, however, 15.9% stand neutral, while around 28% present equally disagree and strongly disagree to deescalating the conflict. 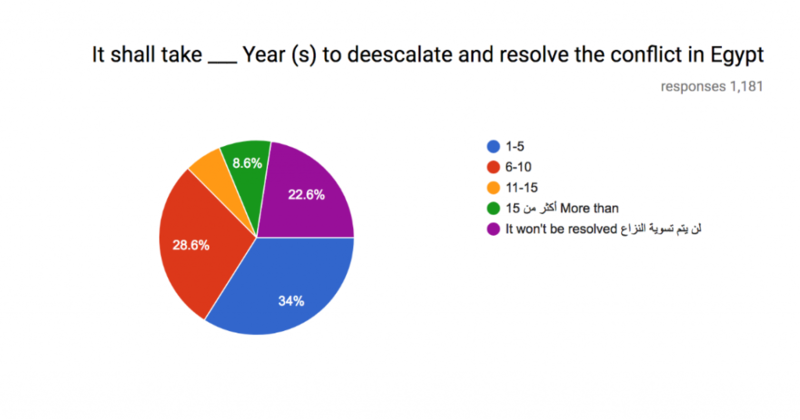 However, when it comes to timings, 34% believe it shall take 1-5 years to deescalate the conflict, 28.6% believe it shall take from 6-10 year, 6.2% believe it shall take between 11-15 years, 8.6% believe it shall take over 15 years to deescalate the conflict, while 22.6% believe the conflict can’t be deescalated or resolved. Moving to the range of violence the surveyed have been subjected to. Only 13% have none of the people they know, or their family members killed in dispersal of protests or sit-ins. 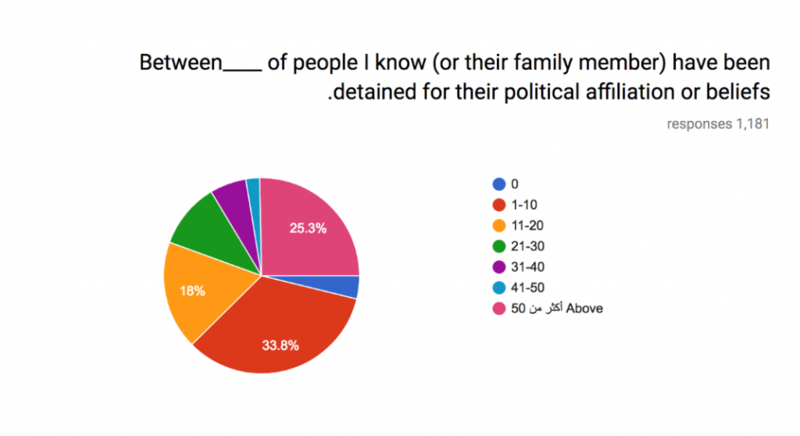 And on the other hand only 3.8% of the survey have none of the people they know, or their family members detained. However, 63.9% stated they haven’t themselves been subjected to either physical violence or detainment. 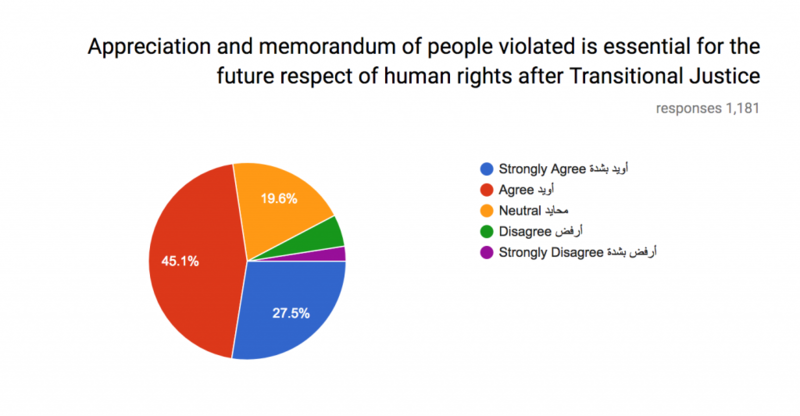 As explained before this statement was a shortcoming, as many of the 63.9% have stated in the free comment space that they have been subjected to other sort of violence or human rights violations. When going more in depth regarding violence range. 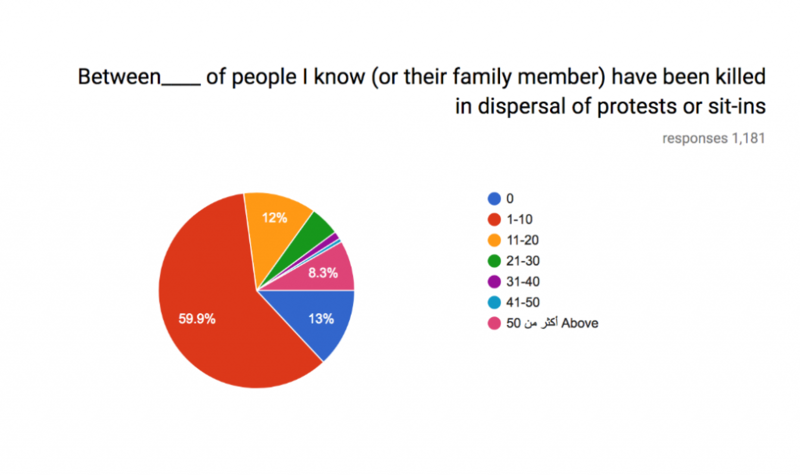 These are percentages of people surveyed who know someone or their family member have died during a dispersal of a protest or a sit it. 59.9% know between 1-10 killed, 12% know between 11-20, 4.9% between 21 and 30, 1.3% between 31-40, 0.6 between 41-50, while 8.3% know over 50 persons killed. Moving on, these are the percentages of people who know someone or their family member have been detained for their political affiliation or beliefs. 33.8% know between 1-10 persons, 18% know between 11-20, 10.8% know between 21-30, 6% know between 31-40, 2.3% know between 41-50, while 25.3% of the surveyed know more than 50 persons detained for their political affiliation or beliefs. Moving on to a different variable, which are the credibility levels of different actors in the society when applying transitional justice. The first statement was: I trust the current opposition to implement justice if the conflict is resolved. A total of 24.8% either agrees or strongly agrees. A total of 52.5% either disagrees or strongly disagrees. While 22.7% stand neutral. 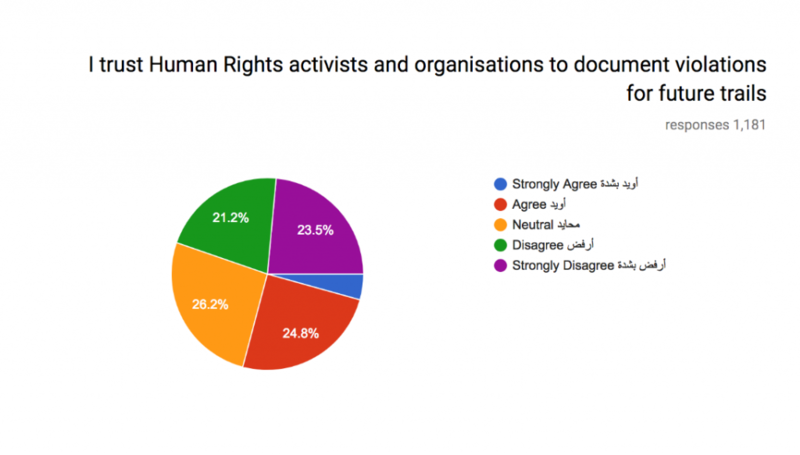 As per human rights activists and lawyers, a total of 29.1% either agree or strongly agree to the statement stating that they trust them to document the violations for future trials. A total of 44.7% either disagrees or strongly disagrees, while 26.2% stand neutral. While the level of agreement to the statement saying: “I trust media to expose any violations or attempt to ignore transitional justice” came in the following manner. A total of 15% agrees or strongly agrees. A total of 62.2% either disagrees or strongly disagrees, while only 13.1% stood neutral. 60.9% equally disagreed and strongly disagreed to the statement. Finally, future procedures and reforms statement have gained above 70% level of agreement within the survey. The most significant level of agreement was to the necessity of reforming both the security and judicial systems in Egypt. 72.8% strongly agreed, 23.9% agreed, while 3.2% were between neutral, and disagreement. As per the second survey due to it’s long length, the detailed results shall be provided in the index of this paper. I will however provide a brief overview of the results here. As per media, over 40% of the surveyed feel unsafe at all and assess their movement as extremely hard, the other 60% varied on the scale and the highest for the safety scale was 6, the highest for the freedom and ease of movement was 4. As per access of information it varied from zero to 6 the highest on the scale, as moderately easy while there were two peaks at 1 and 5, with 23% each. Moving on, from the interaction with the society 46% of the journalists disagree that it’s easy to have reconciliation, 15% agree, 15 stand neutral, while another 15% strongly disagrees and 7% strongly agrees. There is an equal agreement and disagreement however on the possibility of exposing any intentions to disregard transitional justice in any possible reconciliation process. 76.9% of the journalists surveyed see the space provided as not enough for them to be able to expose or document human rights violations. 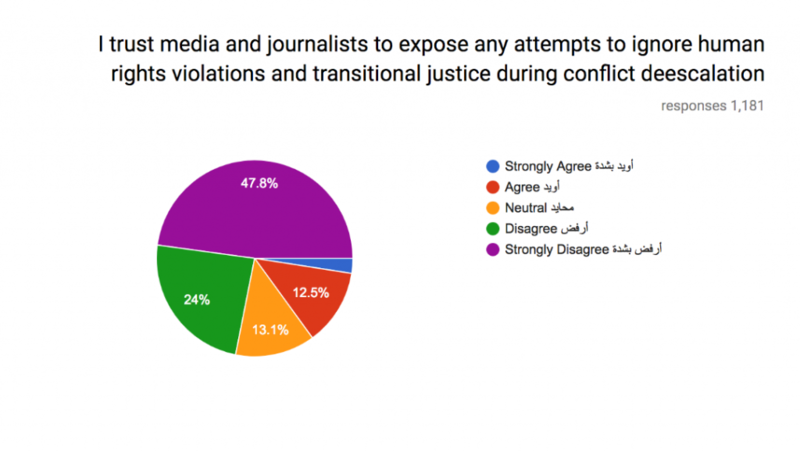 However, over 92% of the surveyed believe media has n essential role in the implementation of transitional justice and 84.6% believe that they have an essential role for the reconciliation process as a whole. (38.5%), and lack of financial support (30.8%). When asked to provide ways of raising credibility of the media, surveyed suggested avoiding state or business run media, activate citizen journalism, creating a journalism pact, enhancing media laws and ethics in Egypt and training journalists in addition to eliminating all journalists who took part in enhancing the conflict. Moving to human rights lawyers and activists, there were two peaks on the safety scale the highest was at zero with (37%) and the other was at 5 with (22.2%) the rest of the answers were among zero and 5. The ease of access to information had one peak with (22.2%) of the surveyed at 3, the rest of the answers varied between 0 and 7. Finally, the highest peak for the ease of movement was at number 3 as well with (22.2%) and the answers varied between 0 and 7. 41% of the surveyed believe that it’s hard to have to reconciliation while, 33.3% believe it’s easy and 25.9% stand neutral. 66.6% of the surveyed believe that human rights activists and lawyers have enough information to put violators to trial, while 22.2% don’t. 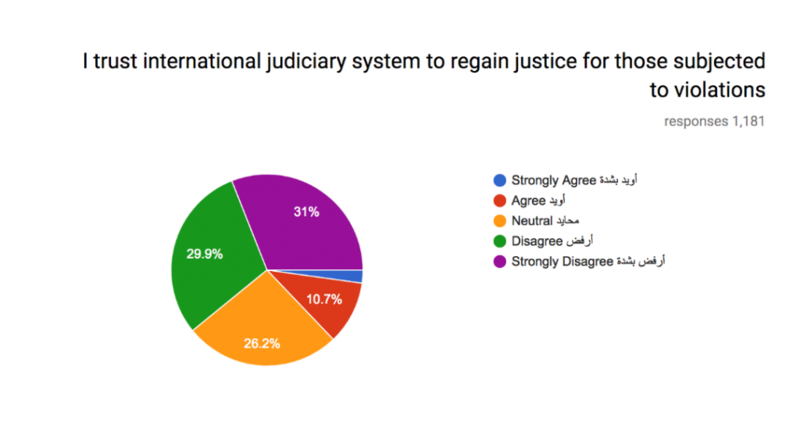 66% of them believe they can strongly contribute to transitional justice, while 70.3 % believe they can strongly contribute to reforming judicial system, and 62.9% believe they can contribute to reforming security system. 51.9% of the surveyed see lack of freedom as a reason of low credibility of human rights lawyers and activists, 48.1% see lack of publicity as a reason, other reasons suggested were the lack of coordination, and the lack of added value to the society in addition to rumors and the absence of the values of human rights in the society itself. 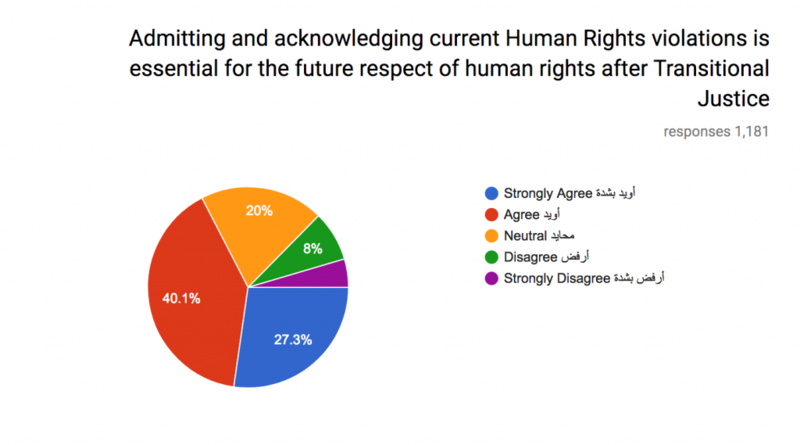 Finally, almost all the surveyed provided their opinion on how to raise the human rights sector’s credibility. The most significance is to provide unaffiliated media publicity, provide a safe area for them to mingle with the society and work more freely, decentralize, training, raising awareness, unite efforts and founding protecting laws for those working in the field in addition to agreeing on human rights ethics. In terms of evaluation of the findings, it’s important to evaluate the audience of the surveys. In the first survey and although it has reached out to a large sum of people, it has only been sent online. Thus, the target audience was Internet users in Egypt, which may exclude at least 20% of the population that suffer from extreme poverty. In addition to that, it has been negatively distributed at many occasions as mentioned before. Moreover, there has not been a pilot of the survey thus there were no revalidation questions added to measure the logical coherency of the answers; which appeared to be needed after the data collection was done. Despite all of that, I still believe that the survey provides a fair representation of 60-70% of the society. It provides a clear pattern of credibility and provides a fairly solid ground to build upon. As per future use, the findings of this survey should be labeled as time based, it should be measured again and revalidated at different times to ensure the coherency of the patterns and to explore the direction of the tendencies. As per the second survey, due to the names and contacts submitted; it appears that the survey provides a fair representation of 85% of the professional societies. Thus, the results could be considered as a general highlight of the working conditions, tendencies and will of contribution among the professionals. Although compared to survey I, I believe this survey is much solid; revalidating it ensures the necessity to continue this segment of the research via interviews to attain more comprehensive responses. To conclude, many of the shortcomings of the surveys are due to geographic, time and fund limitations; and I am aiming to working more on the research in the future if there is any chance to overcome such limitations. The results displayed so far present an indicator on how the society views different some actors within the conflict and how would it be willing to see them work. In addition to that, it provides an indicator on the self-assessment of abilities and views of human rights and media actors. These indicators provide us with a general understanding of transitional justice scopes of applications. Further more, it provides policy makers with an overview of the societal trends and provides them with a general understanding of their current capacity of working and areas they should be working on. 45% of the population. 97% of the sample was between 15 and 45 years old. Thus the results mean that human rights violations are widely spread within a fundamental age group within the Egyptian society. It also implies that the absence of justice to those subjected to violations is a flashing warning of a dark future of continuous conflict. The intensive spread of unjust within this group could lead to violent actions, which show are showing signs already. Also this age group represents mostly the working force of the country, living over 13% unemployment rate with a steady increase of inflation of the prices; while in the same time suffering from atrocities and violations. This age group represents a threat to the country if remained oppressed and not invested in the development of the country. Justice in general and transitional justice in particular are essential to recover this age group’s feeling of unjust; to encourage them to invest their potentials in favor of the country instead of against it. Even with the negative indicator where a maximum of 13% of the surveyed sample doesn’t know anyone who has been killed in a dispersal of a protest or a sit-in, and only 3.8% doesn’t know anyone who was detained for political affiliations and beliefs; slightly above 50% of the sample would agree to reconciliation if transitional justice procedures were applied, in addition to a neutrality level of 15%. This provides us with an indicator that there is still space for applying procedures to attain justice to bridge up the society. In the current situation of zero-sum, status quo, conflict the most suitable actors to function at this stage are human rights activists and lawyers in addition to the media professionals; thus they are the driving variable of this study. The procedures and publicity for tangible judicial and non-judicial actions against the state either within the local or international systems would provide the society with more trust in the possibility of attaining justice and compensation, and shall result in more societal support to the process of reconciliation as a whole. In this section I shall be elaborating on the credibility levels of different actors within the society. Sorting the actors by the most credible to less credible and to the least; I shall provide brief explanation for the percentage of creditability and conclude by providing the reason for the selection of media and human rights professionals as a driving variable of the study. Based on the surveyed sample the most credible actors within the expected transitional justice process; are human rights professionals and activists. They have the highest level of agreement to statements stating trusting them for a certain role in the process, with almost 30%. They also have the highest level of neutrality of 26.2%, which is a good indicator that there is an opportunity to gain more trust and raise the credibility level. The reason that may explain their credibility is that they are the only working actor within the society that ensures the documentation of their sufferings. Their contribution to the process of transitional justice has a wide spectrum that is to be discussed later. However, if their credibility was guaranteed by at least 70%, there is a great chance to ensure a sustainable reconciliation after fair judicial producers and implementation of transitional justice. This is because the society will trust them that the reformed systems won’t abuse human rights again. The credibility and scope of effectiveness of human rights professionals as actors in the process of transitional justice made them the highest actor considered being a driving variable of this study. Moving on, the second highest with credibility levels is the opposition and with 24.8% level of agreement of trusting them to implement transitional justice. The relatively low level of trust and yet high level of distrust with 52% is understood for fairly many reasons. The current main opposition within the conflict ruled for one year where human rights violations haven’t stopped and no transitional justice was applied. Up till now the opposition hasn’t admitted these violations, given that they were applied by the same security and judicial system. However, to regain and enhance credibility, the opposition must admit the abuses within June 30th 2012, till July 3rd 2013. They also must admit not having transitional justice and admit it was a wrong policy, and at the same time show real political movement towards justice for those subjected to violations nowadays; especially at the international level from exile. Due to the reasons stated and the fact of the zero-sum political arena; opposition as an actor has been excluded from being a driving variable for this study; and a considered variable in future studies on the case where more comprehendible study on the actors, their motives, and their possible contributions could be done. The next up are media professionals. The surveyed sample showed an agreement of 15% to their credibility and 13% neutrality. The negative response has taken the rest of the responses with about 72%; yet fairly justified. The role of most of the current media outlets is for the atrocities; promoting and justifying acts of violence towards any possible opposition. However this wide negative response towards media professionals indicates the high recognition of media role, whether positive or negative, in any process for reconciliation, and transitional justice. Media as a tool having a critical role can be invested in favor of transitional justice; however in case not, they should be controlled not to have a negative effect. For these reasons, this study considers media professionals role as critical driving variable that should be studied hand in hand with human rights professionals’ role. The international judicial system is the next credible actor with 13% of agreement and 23% neutrality level. Despite that, there is nothing could be done by the actor itself to raise its credibility for the society. Any action to be done by any international actor shall be based on the local action addressing them and providing them with details on the needed action and its justification. Thus, as per international judicial system it can’t take any actions without local action to present strong cases, support them. Thus, international judicial system was excluded from this particular study, as its role isn’t as essential as other actors chosen to be a driving variable of the study. Finally, with 0.6% level of agreement to trust comes the local judicial system as the least credible actor. 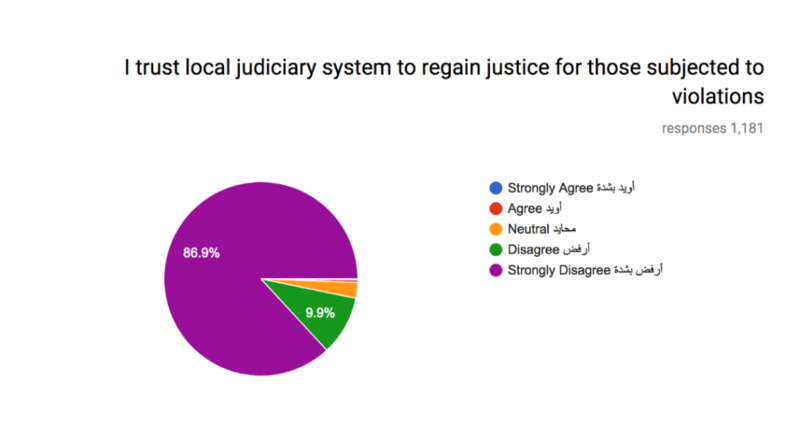 A huge rejection with almost 97% of the responses puts the local judicial system in front of the question of reform. 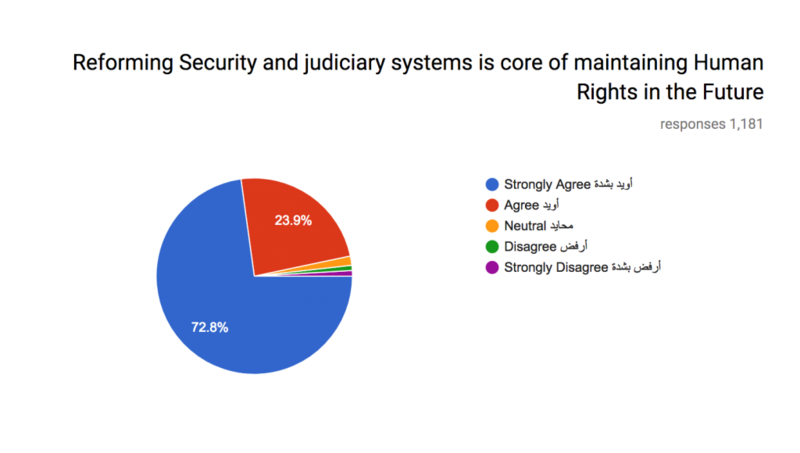 This question has seen 96% responses agreeing that the reform of both security and judicial systems in Egypt is essential to sustain any form of de-escalation or reconciliation. As such, the judicial system can’t be considered as a driving factor of applying transitional justice, however, in future studies; its reform and implementation should be highly considered. Despite the fact that neither media nor human rights responses have reflected a positive indicator on their working conditions; it still showed their willingness with high rates to contribute. However, their contributions can start now. 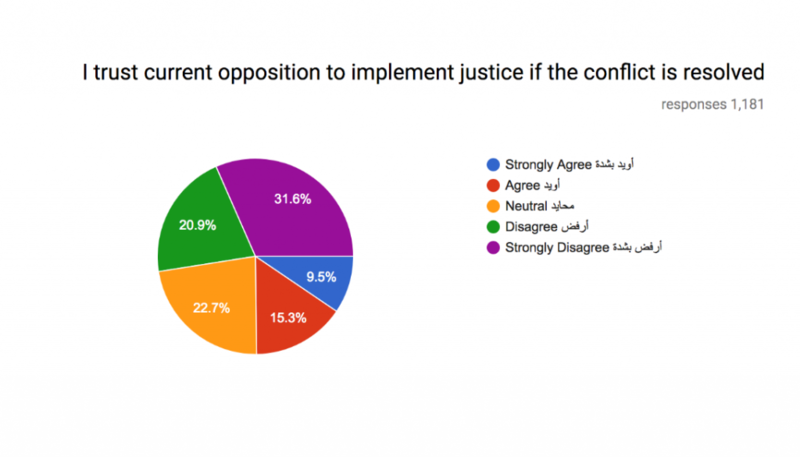 According to the professionals’ responses to the survey, three categories of contributions for a future path of transitional justice can be offered. Raising credibility should be the main priority of both actors nowadays. Media professionals have stated state driven media, lack of information and lack of funds as main reasons for their low credibility. They should start working on manners to counter state media and spread awareness within the society about the necessity of boycotting. Encouraging citizen journalism could work as an essential counter method. It’s unusual for the society’s citizens to take info from another citizen except for rumors. But, when these citizens start to sense the conflict between the news given by “many” of their own and the state media; they shall start to look for the truth themselves in one way or another, or at least avoid polarizing. This in itself shall be a major achievement on the way to justice. On the other hand, come human rights professionals who justify their low credibility by lack of publicity and lack of direct contact. As per publicity, it’s to the media tools to excel in order to be invested by all means in achieving targets needed. However, on the direct contact issue, and in light of the unsafe mobility prospective; its safe to say that the direct contact could be overcome by showing direct relevance. Direct relevance to any human rights case would be by advocating it for it being only “human” extracting any other political context; as such humans would relate to each other. By using citizen journalism and direct relevance – in addition to other ways that need to be researched – actors could increase their credibility within the society and provide justice, transitional justice, with a common ground to start with once procedures are ready to take off. Along with raising credibility comes raising awareness. Driven by the concept of direct relevance, human rights professionals should use all potential manners of advocating human rights principles to get it done. This essential because unless people understand what is their right, they won’t be able to understand that it has been violated; and thus the violation shall never stop. Even within the state actors, it’s important to reach out to them. On awareness, a focused social phycology study is recommended to understand how to reach out for different sectors of the Egyptian society and how to ensure that what is promoted won’t be forgotten. Another scope of contribution both actors are focused foundations. Over 80% of the responses suggested neither foundations that are neither politically nor economically oriented. They proposed national public share fund, or volunteer asset. The first idea is more practical, as volunteer work sustainability cannot be guaranteed. These foundations are hoped to be able to provide a more professional atmosphere for workers. They are also hoped to support promoting the concepts via brands, branches and public interaction. In future processes, foundation could be more authentic and trustworthy in terms of action of reforms or strategic policy planning; as they will have had their reputation -credibility, work and professional knowledge enough to work on it. To sum up, results show fair tendencies towards accepting transitional justice as a path to reconciliation in case of conflict de-escalation. The most credible and critical actors are considered to be media and human rights professionals. Credibility levels and their explanations, have guided the way to shed more right on the relevance of their roles. The focused survey shows how self-assessment has resulted in three main ways to improve, which are: raising credibility and awareness, in addition to building professional foundation with proper funding. Concluding, early research on transitional justice is relevant to case such as Egypt. This paper is more of a diagnostic research than it is a policy paper; which is essential to understand the ground on which we are going to work. Furthermore, results have evaluated and though not completely representative they are a good guidance for future research. The diagnosis run has showed that media and human rights professional are considered to affect any process of transitional justice positively. These professionals can start working today on several scopes where the society’s tendencies are for transitional justice. Working now to ensure credibility and awareness, in addition to concrete foundation; is essential for later on lead of these professionals to the ongoing process of transitional justice.